The first painting I did as a child that I truly loved was an Impressionist style oil pastel of trees in the forest in the Fall. (I still have that one more than 50 years later and still like it!) 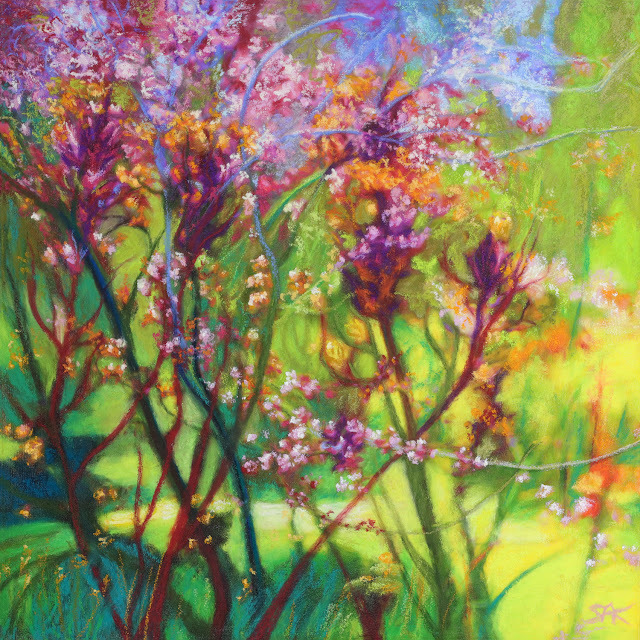 So this piece harkens back to those early days, only this time the subject is Springtime. Trees on the edge of a sunlit clearing bursting with flowers and life on the Chico State campus made me feel happy. So I did this painting of it in oil pastel on a sanded and lightly textured ground on panel. Like many of the pieces in this series, I'm doing the opposite of what many people advise: the usual advice is to simplify. Instead I combined multiple impressions of the same scene, making it more dynamic and complex—and real in the sense of what it meant to me! The original is available. It is 12" x 12" mounted on a 16" x 16" panel painted black. Contact me for more details. Prints and other printed items made from this piece are available in my Etsy shop. I'm playing in this piece with combining multiple impressions seen on the same walk: berries on a tree, plastic netting falling down. The berries in real life were not in the net. This is an invented image. But I like the juxtaposition of natural and manmade, a barrier being warped by the weight of the berries and the impact of space and the passage of time. The original piece is 12" x 12" oil pastel and acrylic gel medium on cradled panel mounted to 16" x 16" on another cradled panel painted black. It's called "Caught in a Web Between Time and Space." Contact me for more information. Prints and other printed items made from this piece are available in my Etsy shop. Funny how things go. I did this painting months ago but set it aside because I wasn't comfortable with the surreal way it turned out. I won't say that was entirely unintentional—I was playing around with combining multiple images and angles of the same piece of landscape. But I was focussed on the tiny wild Chamomile flowers on the path across from my apartment and Chamomile is for relaxing, relieving tension and sleep. This looked way too intensely colored for a feeling like that. But my partner Paul felt differently! He said that a good night's sleep would send him off to dreamland and that's what this piece symbolized to him. Well, sure, why not? So it's back in my "good graces" now and available. The original piece is 12" x 12" oil pastel and acrylic gel medium on cradled panel mounted to 16" x 16" on another cradled panel painted black. Contact me for more information. Prints and other printed items made from this piece are available in my Etsy shop. My latest oil pastel. I'm exploring the abstract in "real" life . . . except this isn't real. I combined 2-3 photographs, all done in the same photoshoot, to come up with a starting place for this piece. This is a progression of the pieces I did to break out of artist's block by looking for things to paint in my own boring apartment complex. I loved this rusty storm drain with bits of dead leaves stuck in it but I wanted it much more colorful. 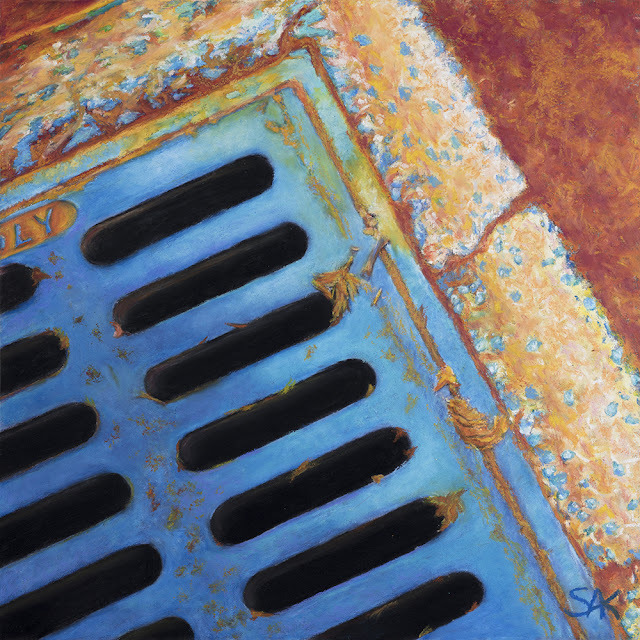 I also like another storm drain that I used in an earlier painting and thought I'd combine them. I guess it appeals to the graphic artist in me. It was also a challenge and great fun to draw and paint, even using the composite photo as an underlayer. I eliminated and added things as I painted, tried to see inside the original photograph on my computer to emphasize what I saw there. Fun, fun, fun! Update: I just got this piece into the National All-Media Juried Show at the Chico Art Center! It starts September 7th and runs through the end of the month. SOLD !!! Prints and prints on canvas are available in my Etsy shop. I'm finding working with oil pastel very challenging but fun! This is my latest. I'm calling it "Awareness" because it's what I became aware of AFTER I tripped on the raised up sidewalk because I was lost in some internal drama! I'm exploring the intersection of multiple images lately in some of my work. I'm interested in the multiple levels of reality we can be aware of if we're paying attention at all, the variety of impressions our brains pick up on whether we're consciously aware or not. In this case it was the sidewalk, the sky, overhanging branches, berries, leaves and flower buds. Contact me about the original. Prints on canvas are available in my Etsy shop. 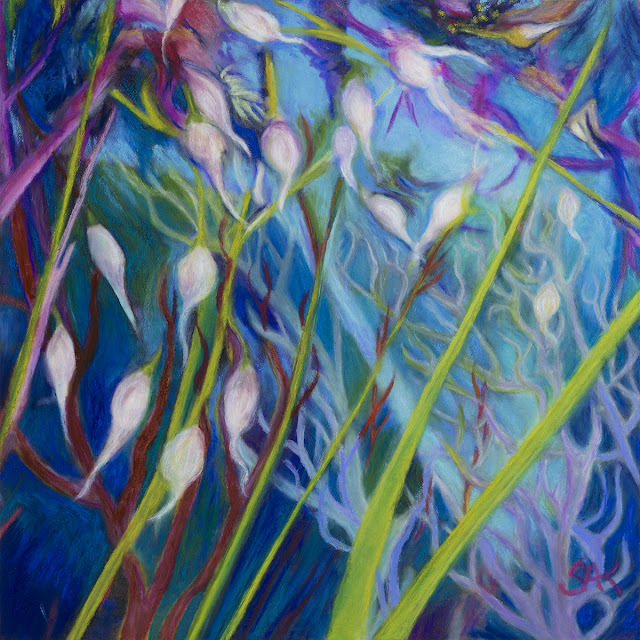 In this oil pastel painting I went for a pretty unusual viewpoint. You are in the crawl space underneath a Desert Sagebrush plant where a rabbit or other tiny creature might live. Seed pods of wild grasses swing in the wind above your head. You are looking through the vegetation at the sunlight coming through the top of the Sagebrush plant with smaller plants underneath reaching towards the light. A friend of mine says it reminds her of fertility and I have to agree! The original is 12" x 12" on cradled panel. Giclee prints on canvas are available in my Etsy shop. I've having lots of fun exploring oil pastel as a serious medium for my work. This piece was done in phases. First Step: taking lots of photographs of leaves and branches over the years so I have quite a nice file of images to use in my work. 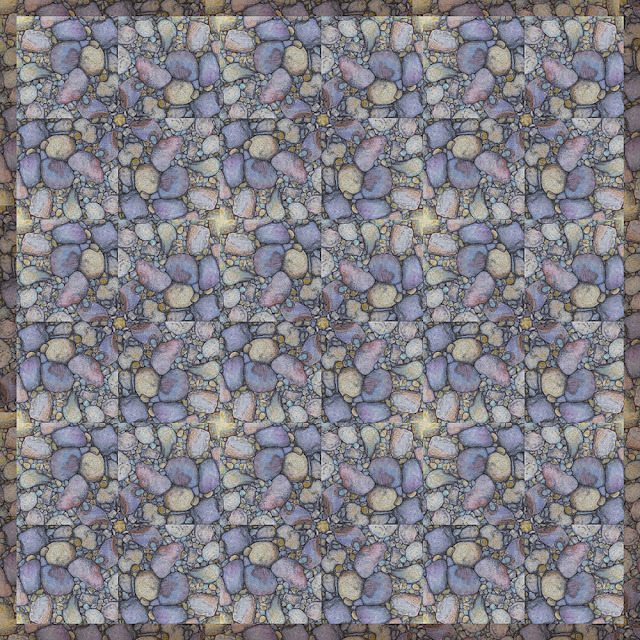 Second Step: combining the images in a variety of ways in several layers in Photoshop using a variety of layering techniques. 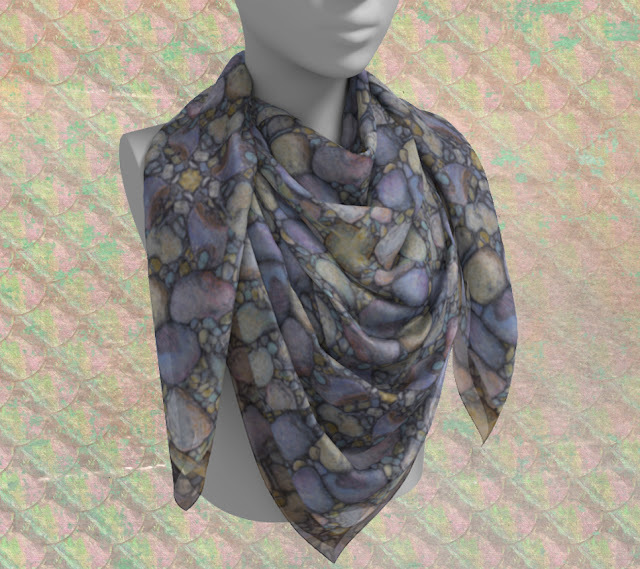 This piece used three photographs and I don't know how many layers because that file is long gone. 7-8, maybe? Third Step: trying a number of ideas in three different software applications to explore various color combinations and looks. This led to many more layers being merged with the original photographic piece. Fourth Step: At this point I had to pause. Should I use this new image as a "reference" photo to draw from or as an underlayer—a digital underpainting—and add pastel on top? I go back and forth on this decision quite a lot as I work both ways and have lots of art class / art critic demons who have way too many opinions in my head! Fifth Step: I say "NO" to the critics. Am I really supposed to throw hours and hours of work away just because it was done with unconventional techniques? I print the piece dark to use as an underlayer. Sixth Step: Using gel medium as glue, I applied the print to a cradled panel I previously prepared with 3-4 coats of PVA size. The sizing keeps acids in the wood from leaching out and discoloring my final work but, despite what the advice is online, the gel medium ought to do that, too. I think. I don't know so I prepared several panels awhile ago. Seventh Step: I added a a light coat of clear gesso to the top of the print. I usually use two coats of gesso but this time I only added one. This created a texture I usually try to avoid but because this image is so multi-dimensional I wanted to see what it would do. I liked it! You can't see the texture well online but it is kind of cool in the final piece! Eighth Step: I scumbled oil pastel over the underlayer. Sometimes I smeared and blended colors together using eye shadow applicators and a Staedler Mars retractable stick eraser that we sell mostly for engineers to use at the art supply store I work at. I don't use the eraser stick as an eraser. It just happens to be cheap, easily cleaned, and firm enough with enough give to be great as an oil pastel blending tool! At this point I made a number of significant changes to improve the composition and get rid of distracting elements. 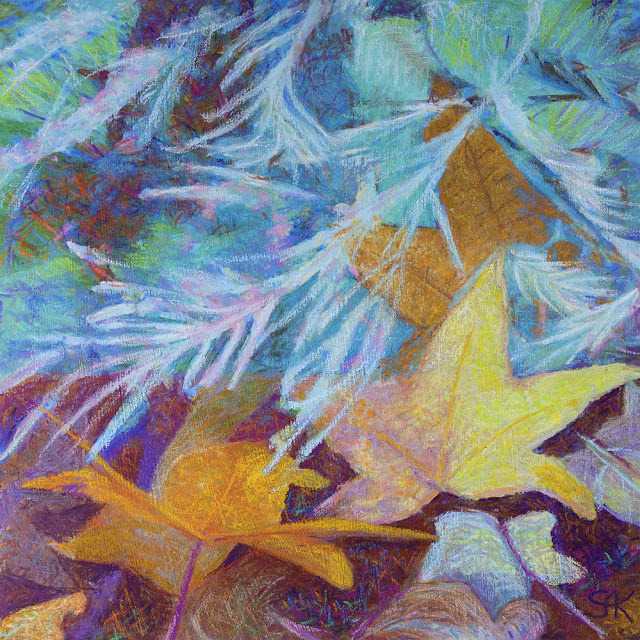 The final result is entirely covered with oil pastel except for tiny bits where the original photographically-derived image shows through as a darker textured color layer. Ninth Step: I photographed my work so I can use it for reproduction and social media. This gives me a chance to look at it through different eyes. I almost always catch something I want to improve when I post a work in progress online. I'll photograph it again at this point if I do but I didn't have to do that this time. Tenth Step: I covered the final piece with a couple of light coats of Holbein Hard Gel Medium to the tops and sides. This is experimental as acrylic isn't supposed to work on top of oily media! But it DOES seem to work. My original experiments using Liquitex Self-Leveling gel have held up for years. I've also used Liquitex Acrylic Gloss Medium/Varnish, Matte Medium, and Glossy Gel Mediums. They all work but have different effects. What I like about the Hard Gel Medium is that it is hard enough to draw on top of easily, it adds a light sheen without being super shiny, and it preserves the textures of the work underneath. But you have to apply it lightly without diluting it. (Don't use water!) I also make sure to brush it on in the same direction as my handwork. And now the piece is done! Well, maybe. I might add a more glossy final coat or one final additional Hard Gel Medium coat (I'm undecided). I'm also thinking about how I want to present it. 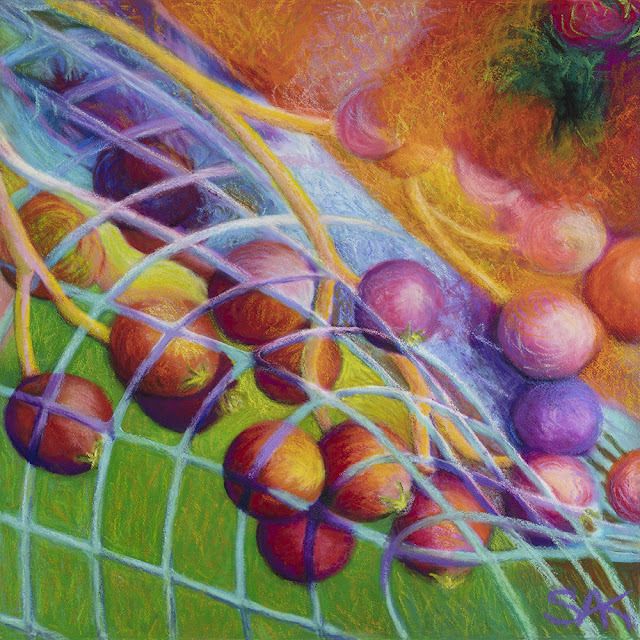 It doesn't need framing under glass—that was the purpose of using acrylic medium. I could just add framing wire and hardware to the back and hang it as is, but I keep imagining it mounted onto a larger wood panel or framed without glass. Contact me if you're interested in the original. I've also made giclee prints on canvas available in my Etsy shop. Happy New Year! This was the last piece I completed in 2017. It came out of the series I did based on what I could see around my usually uninspiring apartment complex. I was trying to break out of a creative slump and gave myself the assignment to either find something interesting to paint or to make something interesting out of what I could find. 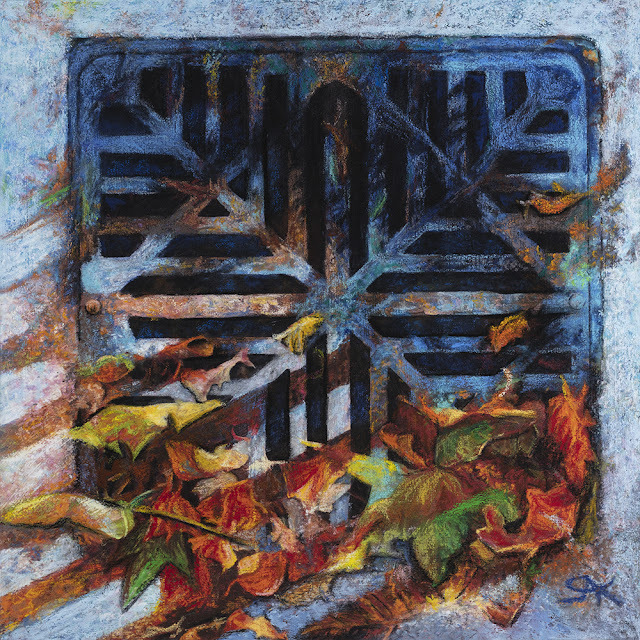 This is a storm drain with bits of fallen leaves stuck to it. I don't know why that appealed to me but it was really fun to do. 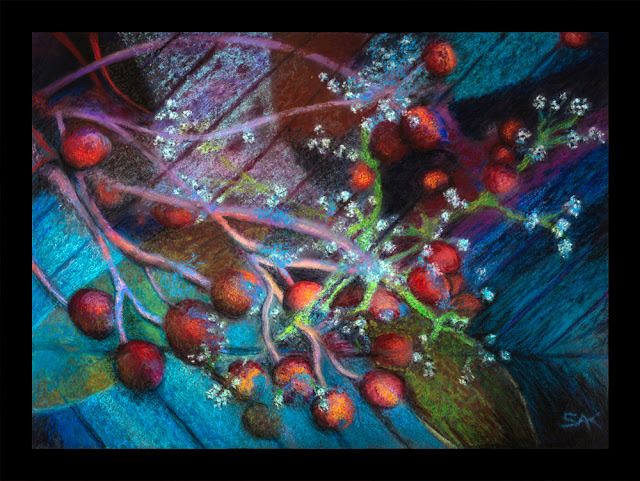 Especially using unusual colors and my new box of really creamy professional oil pastels. It definitely broke me out of the slump I was in! May all our troubles go down the drain as we embark on this New Year! 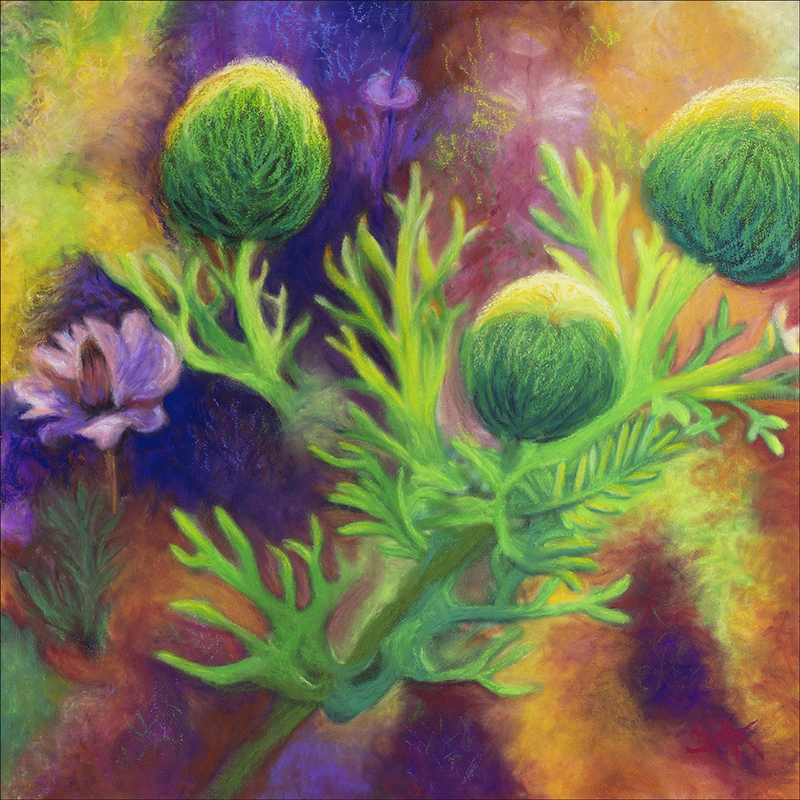 This piece is 12" x 12" oil pastel with acrylic gel medium on cradled wood panel. The original is available -- contact me through the link above if you're interested. Prints on canvas are available in my Etsy shop. I took a printmaking class a year or so ago. It was SO much fun! My favorite technique was linocut but then I tried combining it with more freeform techniques like monoprinting. I went from being obsessed about perfection to being delighted by unexpected surprises. 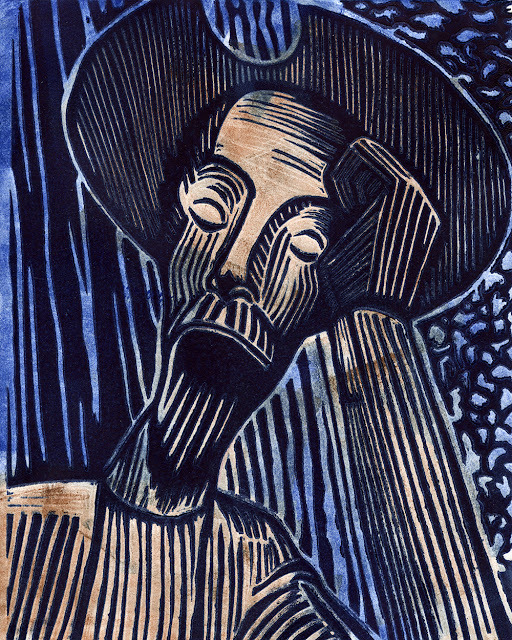 The image depicts Don Quixote, the Man of La Mancha dreaming the impossible dream. Prints on canvas are available in my Etsy shop. I also have this print on pillows and tote bags. All work is copyrighted by Sheryl Karas. Travel theme. Powered by Blogger.